NEW YORK/SAN FRANCISCO (Reuters) - U.S. Federal Reserve policymakers are expected to hold interest rates steady when they meet this week, but may tweak their description of the economic outlook to reflect more benign conditions, leaving the path open for future rate rises. The Fed raised its policy interest rate last December for the first time in a decade when market volatility finally subsided in the wake of a scare over China's economy. Similarly early this year markets wobbled on worries about a slowdown in global economic growth and weak U.S. corporate earnings, leading to expectations for further Fed rates rises to be revised down, so Fed policymakers may be wary of this week sending too strong a message of an imminent policy tightening. Many Fed officials remain spooked by the steep stock market drop earlier this year and by weak first-quarter U.S. economic data. 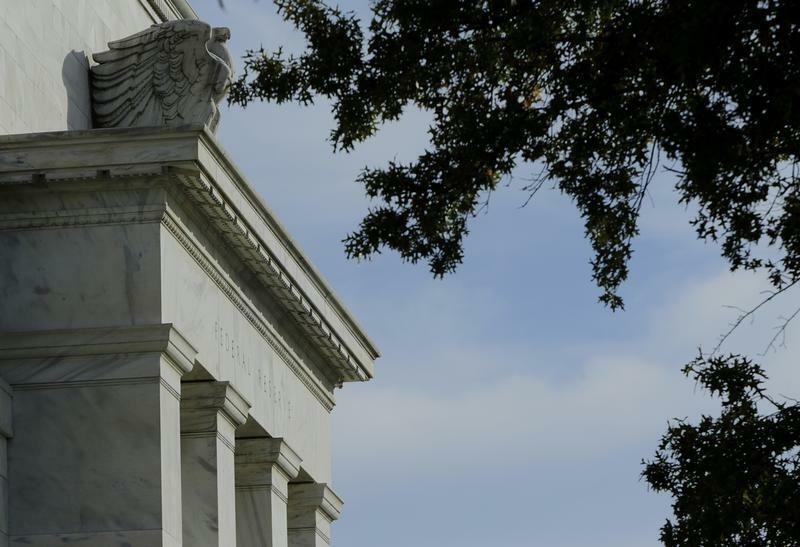 Concrete signs of higher inflation and growth may be needed before the FOMC, the Fed's policy committee, continues with the projected gradual path toward more normal levels of interest rates. Though the U.S. economy is generating jobs and consumer prices have risen, providing support for a Fed interest rate rise, weakness in retail sales and international trade, as well as concern about China's economy, are among reasons Fed Chair Janet Yellen will stay cautious about further rate hikes before the second half of the year. Markets have already anticipated such an approach, seeing no chance of a rate increase at this week's meeting on April 26-27 of the Federal Open Market Committee (FOMC), and are pricing in just a one in five chance of a move at the next meeting on June 14-15. Reuters polling of market participants sees two rate hikes this year. "I don't think they can pull off a June hike without triggering another round of volatility, and they don't want that because the selloff in January and February left a deep scar," Aneta Markowska, chief U.S. economist at Societe Generale, said in New York. "The FOMC can't go too hawkish overnight because markets aren't pricing in anything close to that." Last week the European Central Bank held its policy rates at historic lows and while the Fed is also set to stand pat for now, its policymakers will not stay silent for too long as markets are pricing in barely one rate hike this year, compared with the Fed's view that two will probably be appropriate. Last October, when stock markets had recovered from a sharp selloff and as fears of a slowdown in China's economy were receding, the Fed specifically cited the "next meeting" as possible for a policy move. In December they followed through, raising rates for the first time since 2006. Fast forward to April this year and the Fed is experiencing deja vu. After a volatile couple of months, stocks have rebounded and financial conditions have eased as expectations for China's economy again improved. The S&P 500 index (.SPX) has recovered by some 15 percent in two months while China's economy grew at 6.7 percent in the first quarter. But this time, that's not enough. While Fed officials want to keep the path clear to a rate rise in June, repeating their aggressive pitch for a rate rise of last October will likely be a bridge too far, given that a rise in inflation back to the Fed's 2.0-percent target is seen unlikely. The reading on first-quarter U.S. gross domestic product growth will be published the day after the Fed meeting this week. One way for the Fed to nudge skeptical traders into changing their outlook without roiling markets would be to acknowledge the recent improvement in financial conditions, including near-record U.S. equity prices and a weaker U.S. dollar, by dropping or toning down its warning in March that global economic and financial developments "continue to pose risks." The Fed could also rewrite its characterization of the uncertainty surrounding its forecasts, signaling risks are more balanced. Such a cautious gesture next week could pave the way for Yellen to later use a speech to clearly signal the Fed's intentions for June. Such a strategy could also win over Boston Fed President Eric Rosengren, a voter this year on policy who is usually among the "doves" but has given two recent speeches in which he took issue with the market's "dour" expectations for rates. The Fed's so-called "hawks" typically prefer higher rates while "doves", like Yellen of late, are more cautious. "We see the April statement as leading to a compromise outcome," wrote Barclays economist Michael Gapen in a note last week.